The plumbers installed the high efficiency 50 gallon gas hot water tank in our garage. It is vented directly to the roof of the house through the pre-installed vent seen in the photo. The unit easily connects to our PEX water lines and should service our hot water needs adequately. There are several newer options for hot water heaters on the market, with ultra efficiency gas or electric units that employ a helix shaped element and computer controls, to continuous water tanks that heat the water as you go. These options can add several hundred to several thousand dollars over a simple gas or electric water heater. To cut the initial costs of home construction and open the option to upgrading the unit later with possible environmental tax credit dollars, we simply opted to keep the basic gas water heater unit offered with our home. Nowadays, having instant access to hot water is more of a necessity than a luxury. It allows for personal hygiene and household chores any time of the day. That is why buying an effective and cost friendly hot water heater is necessary. Presently, there are many types of water heaters available, carried by various brands, in various sizes and costs. The variables that need to be considered to make an informed decision are just the same, source of power, source of water, and purpose. Source of power simply means, what will run the water heater? There are normally two ways to run a hot water heater, fuel or gas and electricity. If the water heaters source of power is going to be gas, the user will have to prepare for a higher cost, initially at least. Understandably, proper ventilation must be arranged, preferably outdoors, to preclude gas poisoning and fire hazard. Homeowners who use a gas-run heater need not fret, however, as there is an upside to this. 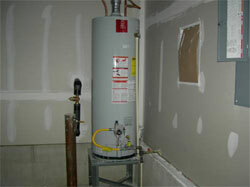 Once a gas-run water heater is installed, cost becomes less in the end. Gas powered water heaters will require less maintenance, which in turn leads to less repair and maintenance bills. In addition, use of heated water is guaranteed even when there are power outages. On the flipside, homeowners using electric-run water heaters need to be aware that it will have a substantial impact to their electric consumption. That is why concerned government bureaus have mandated the manufacturers to make their product to be as energy efficient as possible. Likewise, people who use electric-run water heaters need to prepare themselves for cold showers should there be a power outage or a blackout. Electric run water heaters are cheaper than the ones run by gas. They are made almost maintenance free, fast heating, and do not necessitate ventilation. The source of water refers to whether water is to be kept in a tank or not. If it has to be kept in a tank, then it means that the tank itself where the water is contained needs to be insulated to maintain the water at a certain temperature. This will ensure that every time water is being used, it is at the desired temperature. The tank can either be stationed in a basement, garage or closet, and have the ability to store up to 80 gallons. Water heated through the coils, just like gas-run heaters, may cost more at the onset. The purpose of the heater pertains to whether all the faucets and showers within the household will emit hot water or only certain valves will emit hot water. This correlates directly to the consideration about storage of hot water. If a traditional tank water heater is being used, all water coming out from all faucets and showers is heated, as opposed to only certain valves. When all considerations when buying a hot water heater are taken into account, it would be useful to look into the capacity of the water heater, the size of the unit to be installed, and how efficient the heater's energy consumption is. These additional three variables, just like the first three mentioned, are related to one another. The capacity of the water heater must be commensurate to its size. Otherwise, the user might just end up with, at best, wastage in energy consumption, and at worse, an useless piece of equipment that might just turn out to be a source of accident later on. Visiting your local building supply store or plumbing supply store may be beneficial in seeing to it that you speak to a professional that will help you find a hot water heater that will be suit your budget and your needs as a homeowner.